A 23-year-old woman from Cardiff says she feels “like a different person” after securing a job as a Customer Service Adviser at British Gas. Aimee Hearn from Pontprennau went to university to study dental technology. After a year she decided that she didn’t want to pursue a career in that field and so got a job at a local hairdresser’s but a lack of available hours meant that at the age of 21, Aimee was unemployed. “For months I would visit my local job centre, but struggled to find anything. Applying for jobs and being turned down for interviews made life really hard and it knocked my confidence. When you’re unemployed, people look down on you, but all you need is for someone to give you a chance. In 2014 Aimee joined a team of 11 young people from south Wales on an eight-week course, delivered by British Gas, in partnership with local training provider ACT Limited, the Prince’s Trust and Global Action Plan. 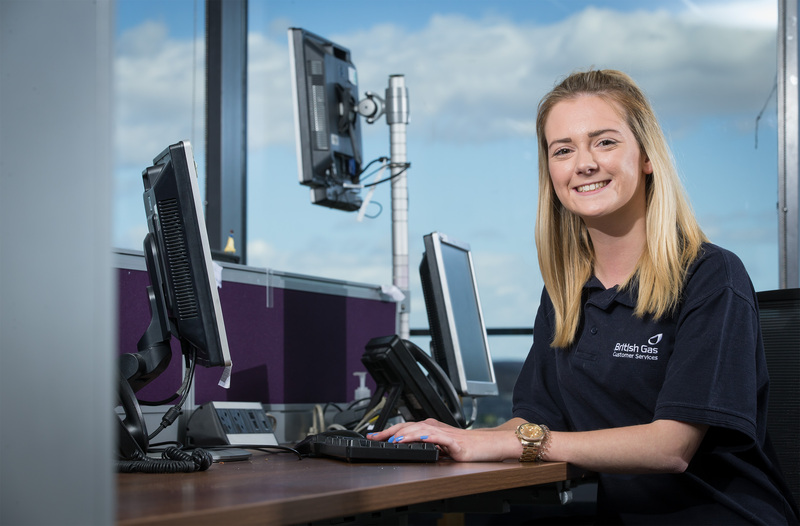 Aimee went on to complete the apprenticeship the following summer and now has a permanent, full-time Customer Service Adviser role with British Gas. “I really enjoy speaking to different customers every day and feel confident helping them with their queries. It’s great being part of a team too. “I feel like a completely different person now. I’m a lot more outgoing and I’m able to enjoy my life again. For the first time, I have a regular wage, which means I can do the things I like. I even manage to save some money. “Our apprenticeship programme gives us the opportunity to offer young people across south Wales the chance to develop their customer service skills and improve their career prospects while also helping us as a company to build a pipeline of future talent into the business and develop a highly skilled and enthusiastic workforce. Minister for Skills and Science, Julie James, said: “In Wales, the number of employers offering apprenticeships is on the rise and I’m encouraged to see organisations like British Gas committing to up-skilling their workforce.